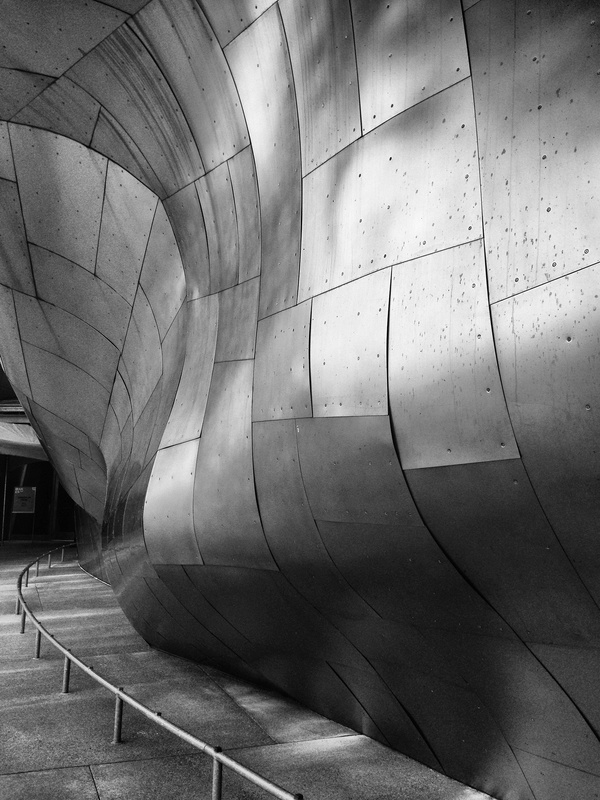 Today’s Black & White Tuesday post is a view of Seattle’s EMP (Experience Music Project) Museum’s silver side. And thanks for the Keith Richards link too, I haven’t heard this one before. What a great song! Amazing work! All those ads make me nervous. Miss you! Thanks very much. I miss blogging and friends here like you . Is it as easy as just asking them to remove? I always wondered about that? They are very sporadic. Good luck! Totally my style! Love it! I like how the black and white shot highlights how the panels are getting a streaky patina, and they don’t fit together precisely. I might not have noticed this in color. .
What an amazing structure! Do you know what those petsafe ads are the pop up on your photos and have to be closed to see the entire photo you’ve posted? I’ve seen them on a couple of other sites, too. This is an amazing shot! Love the angle you took from. Impresionante Imagen En B&W, Muy Buen Trabajo… Un Saludo. I’m so happy you like it, thanks for your visit and comment!